This year is our 40th anniversary and we certainly will be celebrating. We will be walking some of our old challenge events this year. We will be having a group celebration on the 18th August so put this date into your diary. Details will be made available soon. Our first mention was in the November 1977 Strider when Taff Lewis was calling for interest from those in the Blackburn, Accrington and Burnley area. It's interesting how the article comes under the heading of 'East Lancashire'. This is not the East Lancashire group as we know it today but more a general heading for those in the east Lancashire area. Second mention in March 1978 with our inaugural walk taking place 2nd April 1978. It was this inaugural walk in 1978 that really marks the birth of our group which was initially called East Lancashire and Fylde. 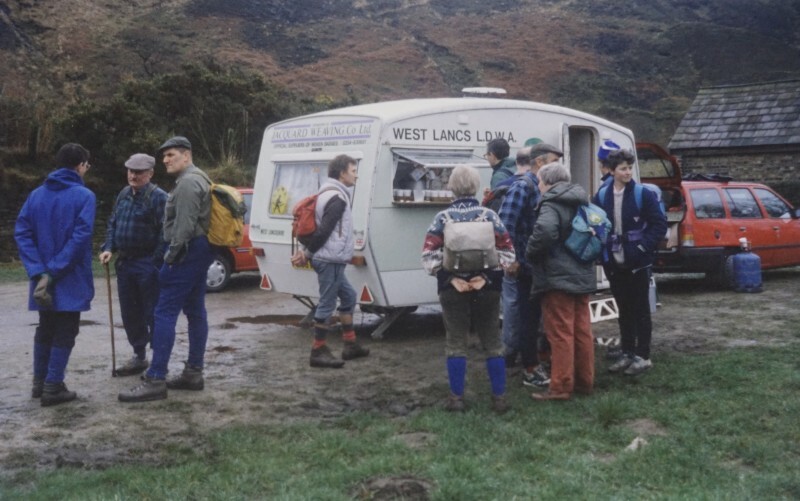 By 1992 our name had changed to West Lancashire and our first programme was publicised in the April 1982 Strider. Approaching the clubs 40th anniversary Karen asked us for some club history. Members since 1988 we have met a lot of people and walked a lot of walks. Here are some that stick in our minds. Eric Unsworth is large in early memories. He was a larger than life person who did a lot to organise the first challenge walks and set the ethos of the group. He loved his food and he made sure there was plenty of food on all challenges and his wife Edna often met us with food on local walks. 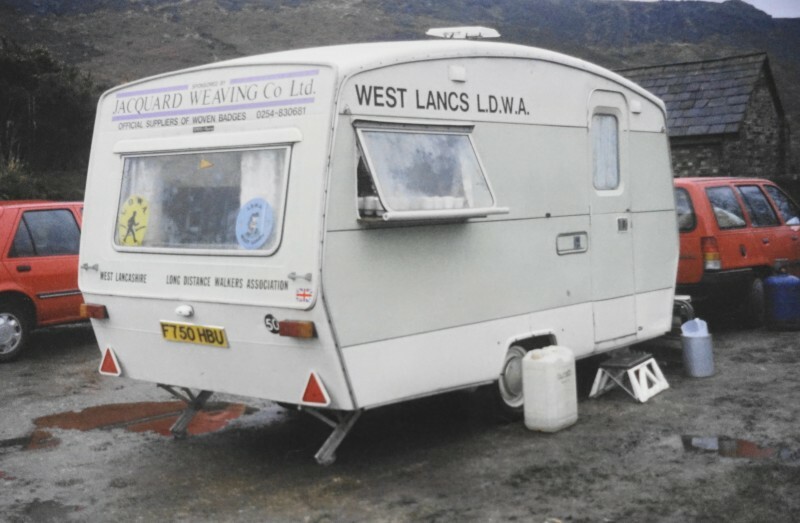 He had a caravan which was very useful on events. When using it for the Duddon Landscape he got stuck when he could not get it up the steep hill – I think all the food had to be unloaded and they made do with the back of the car. Eric’s dog Clyde is buried on top of Great Hill – with his lead and a pork pie. Eric organised a walk of the Rossendale Way, staying in a community centre – and woke everyone up with banging 2 pans together. Tom Lyons did a lot with Eric and made many signs for the group. He was involved with the design of the club badge based on two of the members. The Amble, the group’s first and flagship event, was run twice yearly for some years. It was based at Rivington Barn for many years which was an ideal venue for the 500 plus entering the event. It always used to be totally organised by the organiser, just with help on the day from checkpoint staff. Other events were “The Wideawake Walk" from Dolphinholme, organised by Gerry and Maxine. The Sirloin Stroll disrupted by major gasline works, followed by the Whittle Wander – bisected by the M65. For many years we went to Brinton’s carpets event, with an award of a large shuttle being awarded to the group with the largest entry. We held this for many years. Unfortunately both shuttle and event disappeared. Another good social event was the Halloween Happening based at Sideburn Youth Hostel. Christine the warden always decorated the hostel and provided parkin etc. on return. This developed into a weekend event with a social walk on the Sunday. Dave Connolly was overwhelmed one year to find himself leading 64 people on his walk. The Boddingtons marathon was run for many years – thanks to Tom Lyons. For some ten years Jean led a weekend walking in Derbyshire – with backup in a minibus thanks to a friend of Bobs; Peter. We have also taken part in many IVV events and indeed Jean still does the Nijmegen Marches. We then started getting more adventurous with walks abroad in Spain and Turkey organised by Ann Hearne and Mike & Kate. Jeff Parr organised a series of Kanters, and also devised the Lancashire North to South walk – greatly enjoyed. Charles Thompson helped the group enormously, leading numerous walks, including The Ruins walk and the Long Chipwell Ridge. For some reason this necessitated the mowing of the grass verge on the A59, he also devised various gadgets to help on checkpoints. He also started and led the FOTY walks for many years. The group has always had a good social life, with the Christmas pudding plod started in ?? Birthday walks were started off with a surprise birthday walk for Doreen. Bob & I had a Ruby wedding walk, and more recently Mike & Kates had their Munro celebration. Although nothing to do with walking Bob & I are forever grateful to the West Lancs Secret Gardener who did so much work on our newly acquired overgrown garden when we were away. We had a newsletter which was published for many years and has now been superseded by the excellent website. A large part of our walk programme has been the Tuesday walks which were started for Pauline Edwards so that she could fit in a regular short walk whilst caring for her husband Laurie. They have always been extremely successful. For many years the group manned checkpoints on the LDWA 100 mile walks, with Eric towing the caravan down to Kent to an idyllic spot on a cricket field. Another was to Shropshire where my main memory is of having to peel 500 hardboiled eggs. At Dent in Yorkshire we manned the baggage tent. What an assortment of baggage – we lost one bag but it eventually turned up caught in the folds of a rolled back tent door. In Northumberland we ended up cleaning out a sheep fold as the farmer had given us a barn stacked with hay –totally unsuitable for a checkpoint. In Scotland we just had a small bar area in a village hall with only a tiny glass washing sink. Toast was on the menu but 2 toasters blew all the fuses. This was also the base for all the food for the whole event so the whole hall was full of food with nowhere for the walkers to sit. Another 100 in the Lake District saw us having to administer first aid to many dehydrated walkers as the weather was so hot. All the social life involved with the group has led to several weddings; Gerry and Maxine, Doreen and John, Paul and Kate Clarkson, and Janice and George Moughton. This last wedding took place on a Scottish island and Doreen and John were the witnesses – much to their surprise as they were called upon whilst on holiday in Scotland. Meetings have always been held in pubs, I believe the Bluebell in Preston was one of the first, The Mill Tavern, then Peters Bar and now the Sea View.